An under-strength Republic of Ireland side pulled off a surprise win over Italy in Tuesday's friendly in Liege. A first-half strike by Keith Andrews and a late second from Simon Cox gave Republic boss Giovanni Trapattoni victory over his native country. Blackburn's Andrews drilled a low shot past Emiliano Viviano after a short free-kick move in the 36th minute. Cox's close-range finish near the end sealed the Republic's second ever win over the four-time world champions. The other victory was the memorable win under Jack Charlton at the Giants Stadium in New York during the 1994 World Cup. Trapattoni selected what was in effect a reserve side and afterwards defended the staging of the friendly, saying it gave young players much-needed international experience. Following their Carling Nations Cup success and Saturday's Euro qualifier win in Macedonia, it was the Republic's fourth win and clean sheet in a row. It was achieved with a team which retained only Andrews and Stephen Hunt from the 2-0 win in Skopje. The Republic had the best early chance when, after an exchange with Andy Keogh, Reading striker Shane Long dragged his left-foot shot wide of the far post. However, the Italians were having the bulk of the possession and had the Republic on the back foot when midfielder Claudio Marchisio broke from deep. He passed to striker Giampaolo Pazzini, who fired wide from a tight angle. The Irish frustrated Italy with some determined defending and keeper David Forde, starting his first full international, was quickly off his line to deny Marchisio. Then came Andrews' stunning strike for the Republic from a short free-kick move after defender Alessandro Gamberini's foul on Long. Hunt played it short to Andrews and, after a steadying touch, drilled a low shot past Viviano's despairing dive and into the bottom corner. 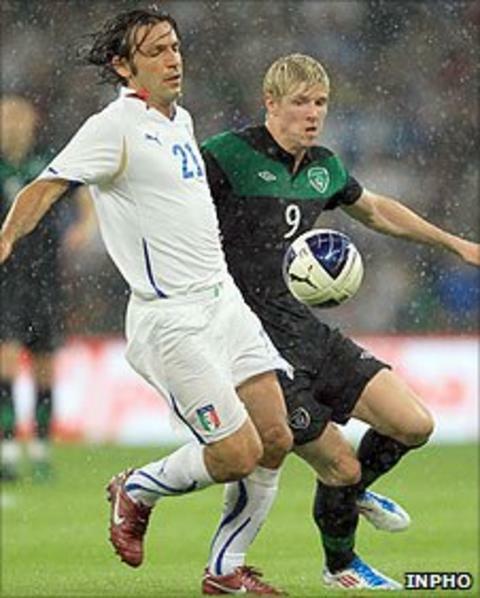 Italian manager Cesare Prandelli brought on Angelo Palombo and Alessandro Matri at half-time and, for a spell, they looked like causing Ireland problems. However, all their pressing came to nothing and it was the Republic who snatched the second goal as Hunt made headway down the left before picking out West Bromwich Albion striker Cox, who could not miss from in front of goal. Republic of Ireland: Forde, McShane, Ward (Delaney, 90+4) St. Ledger, O'Dea (Kelly 83), Foley (Whelan 60), Coleman, Andrews, Hunt, Long (Cox 60), Keogh (Treacy 75). Subs not used: Murphy, Lawrence. Italy: Viviano, Cassani, Gamberini, Criscito (Balzaretti 66), Chiellini, Marchisio, Pirlo (Palombo 46), Nocerino (Giovinco 59), Montolivo, Rossi (Matri 46), Pazzini (Gilardino 59). Subs not used: Buffon, Sirigu, Maggio, Ranocchia, Ogbonna Obienza, Cassano.